In light of all the photos beautifully taken, or of beautiful people. I thought it might be a good time to discuss VU. Although it sounds like some obscure venereal disease, it’s real meaning is Voluntary Ugliness. Come on people, don’t do it. Fashions come and go, and there are a lot of people who do take them way to seriously. However, there is nothing more serious than VU. Don’t want to fashionable? Don’t bother! But please don’t give way to VU. All you have to do is find a look that works for you and rock it out. No more glasses that make your eyes pop out, please don’t abuse corduroy or turtlenecks, don’t blame it on money, because you know that you could look cute even in torn shards of fabric if you wore them right. As a person who sometimes takes themselves pretty seriously, I have to give it up for superficiality this one time. Let’s make a pact to try to look our best for just one week, then a month a year, forever. This city really needs some brightening up and so does everywhere. Don’t fall victim to VU, let your beauty sparkle, razzle, dazzle and …ok I’m stopping I promise, but on that note, for the next week I will be posting photos of the bravest VU resisters that I encounter on the streets, cafes and clubs of New York…. I never did have my latte this morning and I began to feel the burn- of coffee not through my blood-halfway through the Bad Art Auction at Le Poisson Rouge. 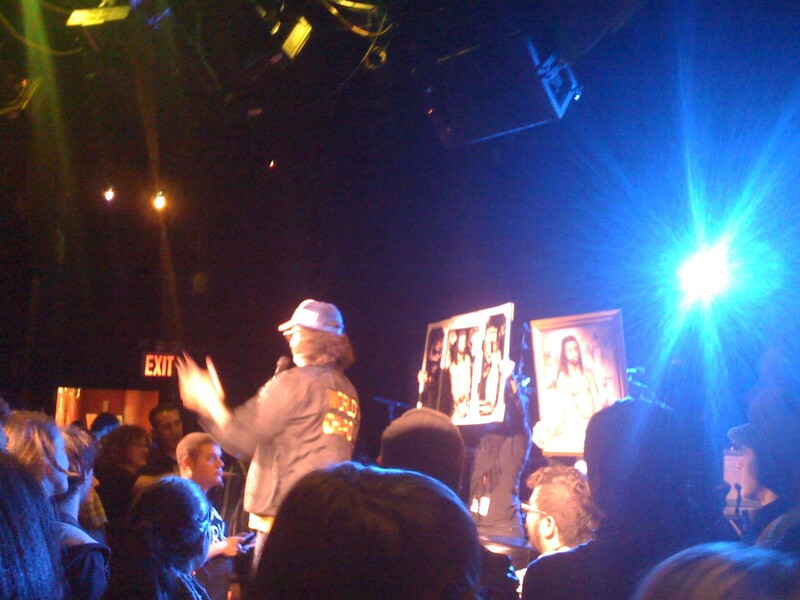 The premise of the evening was this: Judah Friedlander aka Champion of the World (one of the 30 Rock (which I’ve never seen) writers ) auctioned off bad art, as a benefit for New York Cares. The night was sponsored by New York Magazine and attendees received a free year-long subscription to the rag. The spectacle was amazing, (that’s sarcasm). People were paying one or 2 hundred dollars for xerox copies of 80s faux-art ephemera, macrame owls and racially offensive Christian paintings. It was hipster heaven, I feared that Williamsburg had been momentarily misplaced and supplanted within the walls of Le Poisson Rouge. I was so inspired by my new and trendy crew that I decided to table dive. Decidedly sober, I resisted the open Vodka bar after last nights excess. Instead I focused my sights on food, other people’s food that is! There was some kind of staff meeting and several appetizer plates had been ordered, many of which were untouched. At one point everyone at the table just up and left, what was a hungry lady to do? That’s right, I dove. Tablediving rules! It is the word for the day. Tablediving: The art/science of spotting un-eaten food on stranger’s restaurant tables, then grabbing and eating it in the space of time after the strangers leave the table and before the waitstaff clears the food. I saw Dr Atomic at the Metropolitan Opera this afternoon. The Opera was written in 2005 about Dr. J. Robert Oppenheimer, the scientist who invented the Atomic Bomb. He is painted as a modern day Faust. A heroic villain, distinctly human, but made mad by the zealousness of discovery and dominance. Oppenheimer is pictured referring to the bomb, pre-test, as a great “luminescence.” He focuses on its momentary beauty, not the destruction that it will yield, or the fact that as the Germans have already surrendered, its use is no longer necessary or potentially justifiable. Serving as a valuable history lesson, Dr Atomic informs the audience of the semi-mutiny at Los Alamos. Apparently many of the other scientists on Oppenheimer’s team did not want to use the weapon against Japan, without warning, at such a late stage of the war. Additionally, we learn that paradoxically, Oppenheimer, warmonger that he was, was also a highly literate lover of the arts. He spoke several languages, adored poetry, often read the Bhagavad Gita in Sanskrit and Baudelaire in French. He composed sonnets in his spare time! The poems that he so loved are incorporated into the opera. Ultimately he is faulted for masterminding such immense destruction, but there are a few too many warm and fuzzys given to the father of Hiroshima and Nagasaki. Opera is really fun, for those who haven’t given it a go, I recommend trying. The met has a lot of discount options, like student rush, standing room and HD projections at movie theaters. The word of the day is Getoutofmyfacebook: A new web 2.0 application currently being developed by haters. The word of the day is Hateration: A combination of admiration and hate, as in hating, as in ‘Don’t hate.’ (I had heard this word used before in songs, but honestly didn’t know what it meant until Tyra provided the proper definition) When you admire someone and most likely envy them, you hate on them as an expression of your insecurity. I also learned that Woopi Goldberg, co-host of The View claims not to be gay, nevertheless fiercely defends the rights of gay people, including that of marriage. This is the same Woopi, who ‘played gay for pay’ in Boys on the Side. Interesting. Oh god, I forgot that I also watched Zoolander. No wonder my brain resembles soft candy ahora… Alright looks like I didn’t learn that much from TV after all. Hopefully the night will redeem me, I am going to go see Acoustic Cash, a sort of live talk show format, that centers around Roseanne Cash. She will interview Joe Henry, and I reckon they will also play songs together. We’ll see.